Warhammer Quest : Dungeon rules by John K.
These are specific rules for several individual board sections. The next door is locked. The key can be found on the end of the chain in the fetid well. In order to pull up the chain, a warrior must roll 1D6 and add toughness (not armor) to brave the stench. Success on 7+. A 1 is still a failure. Each warrior may make one attempt per turn. 1 Wizard may cast no spells when in the room. 2-4 One of the wizard's spells does not work in the room (determine randomly). 5-6 Wizard gains +2 to his Power Roll if he is in the room, but a 1 is still a 1. Only brown corridors may have a doorway on the side. All greys must have the doorways on opposite ends. +1 to hit a model on a lower level. -1 to hit a model on a higher level. You cannot move diagonally on or off the stairs. The first time an unexpected 'E' event occurs on this board section (while no monsters are on the board), it is the falling block trap. Determine the warrior affected, then roll 1D6 and add initiative. If the result is 6 or less, then the warrior takes (BL)D6 damage, modified for toughness and armor. A natural 1 is still a failure. Whether hit or not, put the falling block counter in his place and move the warrior to an adjacent square, moving models out of the way, if necessary. The original square is now blocked. If warriors are cut off from the light source they have two options: roll on the Escape Table, or sit and do nothing until rescued. No events will occur for the warriors who are waiting. A dwarf pick may be used to dig through the rubble of the collapsed passage, if the wielder is not in the dark. There is 30 units of rubble blocking the passage. The first time the party finds this board section, a pick or shovel is there which can each remove 1D6+ST units per turn. Up to two tool-using warriors may work per turn. If either rolls a one, then no rubble is removed that turn. A dwarf wielding a dwarf pick removes 6+ST rubble per turn. Once cleared, replace with a corridor board section. Roll for each tool used afterwards. It is ruined on a roll of one. A Cave-In contains 1D6X10 units of rubble that must be cleared, while the Collapsed Passage contains 20 units to get around a stone block. However, only one warrior can work the latter per turn. Downstairs, the maximum number of monsters arrive, except in Objective room. (Optional: downstairs, 'E' events can occur while monsters are on the board, except in the Objective Room). Split the decks as normal. Now roll 1D6 and add that many unused dungeon cards to the pile representing the doorway, but not to exceed the original number of cards. The remainder are placed on the pile representing downstairs. Example: there are two cards remaining split into two piles. A four is rolled. Place one card upstairs (total =2) and three downstairs. If monsters appear downstairs, then the maximum number arrive, except in the Objective Room. (Optional: downstairs, 'E' events can occur while monsters are on the board, except in the Objective Room). 1 Add two dungeon cards to each Dungeon Deck branch. 2 Add one dungeon card to each Dungeon Deck branch. 3 The X-Junction/ Cross is treated like a Room. Draw an Event Card when entered. 4-6 Place a T-Junction Board section as normal. The first time in a turn that a warrior is standing on the bridge and either attacks a monster or is attacked by a monster, roll a die after the to hit and damage rolls. On a roll of one, he must be immediately saved by the rope or spell to avoid falling to his death. Also use this rule to determine if a warrior loses his balance next to the pit in Gorgut's Lair. Do not connect doorways to the sides. 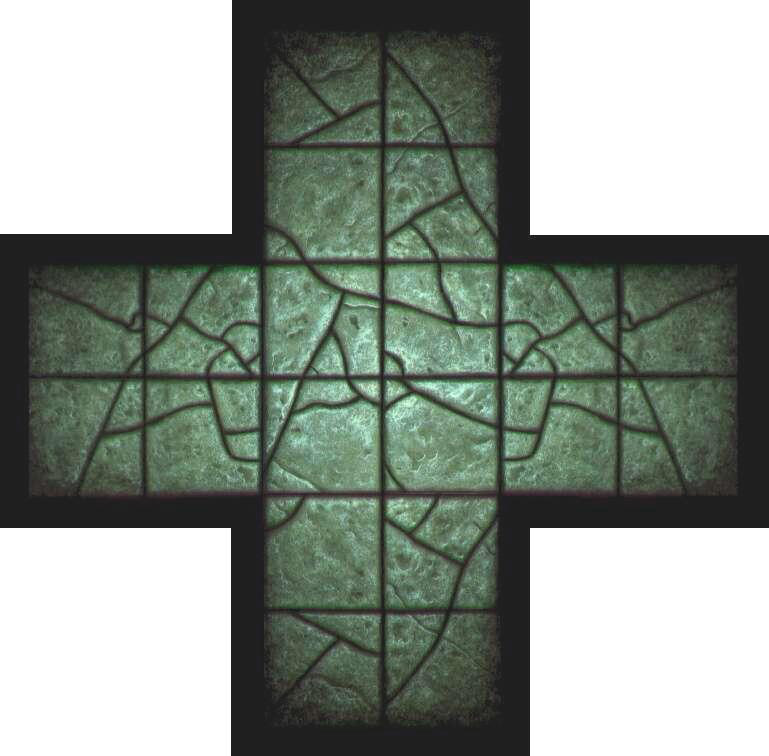 Use the board section as a 5X4 dungeon room, with 5 the distance from doorway to doorway. a. Warriors enter above the pit in Adventures 1-3, and through the pit in Adventures 4-6.
b. Models are not pinned by those on a different level and may only fight them with missile weapons or weapons for fighting in ranks. c. If levitating, a Warrior may fight an adjacent Monster on a higher level with normal weapons,or use remaining movement to step to an empty space this turn or at the start of the next turn. d. To climb out of the Pit, a Warrior may use a rope (his own or the one displayed). Roll for breakage. e. To climb without a rope, it takes a Warrior 3 turns of movement (he forfeits 2 turns of Attacks). f. To jump into the pit roll 1D6 and add Initiative. Success on a 7 or greater. Failure means he takes 1D6+3 Wounds from the spikes and the fall. If the Initiative roll was a natural 1, he is stuck on the spikes for one turn and is +2 to be hit. On his next turn, he takes an additional 1D6+6 Wounds (not modified for armor), to free himself.